Childhood is a wonderful time of life. It’s filled with the greatest mental and physical growth a child will ever experience, and that’s why it’s so important that a child is in an environment that ensures they are receiving proper input for all of their senses. And because our Christian daycare center takes Proverbs 22:6 very seriously — “Train up a child in the way he should go; and when he is old, he will not depart from it.” — we also make sure that their experiences are linked to God in some way. Parents who go online searching for “Christian daycare near me” are, of course, very interested in making sure that their children are getting proper worldly and religious experiences on a daily basis. Here’s how we make sure to involve all five senses of each child every day for both mental and spiritual benefits. It seems that most of humanity view themselves as visual creations. In fact, this informal poll found that the fewest percentage of people would be willing to give up sight if they had the choice when it comes to their five basic senses. With so many people valuing their sight, it’s not surprising that it’s such a primary way in which young children are interacting with the world. Our church daycare center is a bright, inviting place inside and out, filled with decorations that kids love. We change them up for the season as well so that kids know what holidays are coming up. You won’t be surprised to know that we decorate quite a bit for Christmas and Easter. Since we’re a Christian preschool, we’re able to put the message of Jesus in front of kids no matter where they are in the building. That means they’ll see bulletin boards with Christian messages and posters that highlight Bible stories. They might see a Ten Commandments poster or one of our many Bible picture books. We have to admit, it’s hard to turn around without finding something Bible-related around here! The second most-relished sense seems to be the sense of hearing. And it makes sense (pun intended, thank you very much) considering how much of our interaction with people is via speech. If someone you haven’t seen in a while is coming, you’re happy to see them, but talking to them is probably your primary interest. You won’t be surprised to know that our church preschool is a pretty exciting place and often filled with sound! 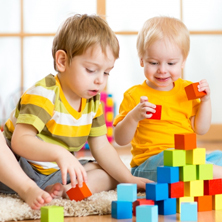 While there are certainly quiet times (especially for our daycare ages when they’re napping), it’s an active and exciting atmosphere where kids are always having fun. There are also plenty of times when the teachers are actively working with the children to impart knowledge. Sound is incredibly important when it comes to teaching children about God at our early childhood education center. Bible stories are a big part of our day, as we tell kids about Bible heroes and read them books about things that happened so long ago. Such books are a great way to interact with kids because they’re both auditory and visually stimulating. Music is another excellent way to instill the word of God into kids minds. Using music with words can help kids learn Bible verses so much easier than just telling them the phrases or having them memorize them. Music gets them involved; while they might not be able to read at a particular age, most kids have no trouble singing along. Plus, music is something that they can take home with them. Most parents have certainly learned a new song from their kids simply by driving them home in the car! Finally, there’s one more way in which sound can be used as a way of expressing God to children: caring words. Jesus tells us to take care of children, and one of the ways we express this is via the kind words that we use with them. We can also speak God’s word to them to teach them how to interact with others. Kids are naturally affectionate, and many of them are always hugging us or hugging others in the classroom. Of course, we’ll always work with parents and the children themselves to ensure that everyone is comfortable with the amount of affection being shown. Babies really need attention, and we’re more than happy to give it to them! Science has shown again and again that touch is something that all children need to thrive, because it’s a natural part of the human experience. Many of our church daycare workers spend much of their days holding babies and playing with them, ensuring that they always know they’re safe and secure. For our entire daycare center and preschool, there’s another aspect of touch to consider: the environment. 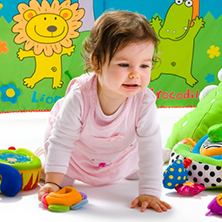 Our preschool center is filled with objects to entertain kids and let them explore their sense of touch. 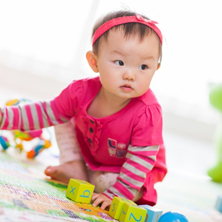 Soft stuffed animals, hard blocks, oddly-shaped interactive toys…all of these are perfect for helping them explore the world. Because so many kids are staying at our all-day daycare for most of the workday, they’ll be having at least one meal with us. And since kids are growing so much, they’re almost always hungry! God has given us all that we have, which means our food as well. While God is brought up at various times throughout the day, meals are a specific time where we’re always sure to thank him for the food. Whenever kids eat, they should always remember to thank God! The most common smell that kids will experience when they’re at our Christian daycare is the smell of clean! We keep the place very clean, not only because it’s a state requirement but also because we don’t want kids to pick up any sicknesses while they’re here. We have an air purifying system that takes out dust and pollen, so when the kids take a big breath they’re less likely to suffer any ill effects. Smells are everywhere in the Bible! Fragrant offerings, myrrh, frankincense, oils…all of these played important parts during different points in the Bible. We have to admit that this is a tough one when it comes to our children’s daycare center. There is the smell associated with the meals and snacks we have here, and there might be some scratch-and-sniff books that kids enjoy. But of all the senses, this is probably the one we use least here. If anyone has any Bible lessons involving orange peels, let us know! Teaching Kids About God All Day Long! Here’s what it comes down to: there’s always an opportunity to teach kids about God’s love for them! 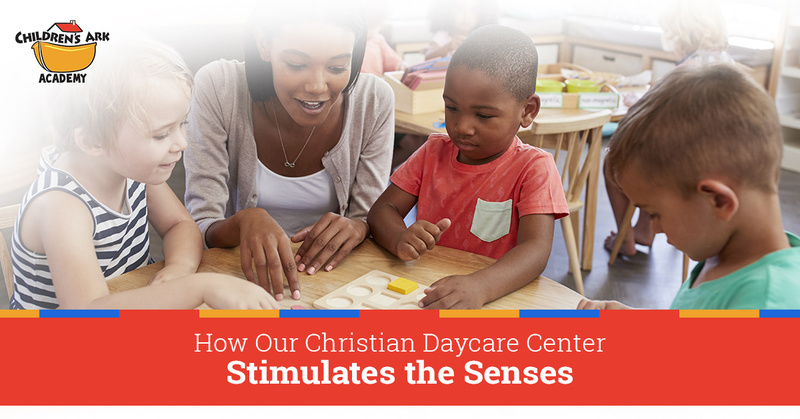 If you’ve been searching for “Christian daycares near me” and would like to take a tour of our Christian daycare facility, we’d love to hear from you. Contact us today!